In stock 182 items in stock. 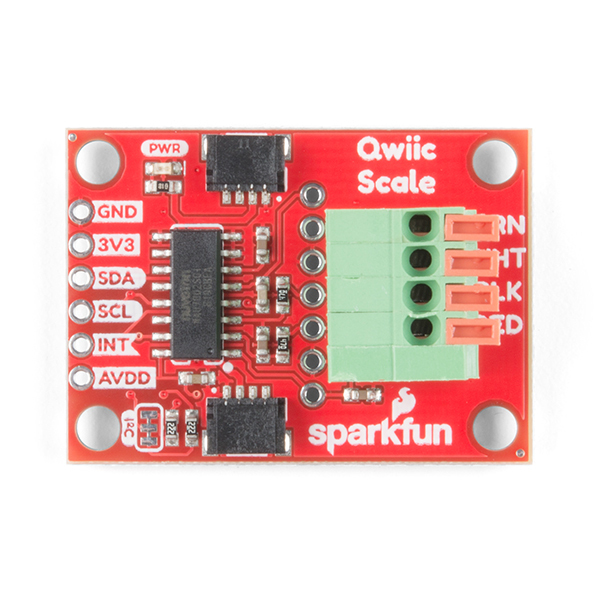 The SparkFun Qwiic Scale is a small breakout board for the NAU7802 that allows you to easily read load cells to accurately measure the weight of an object. 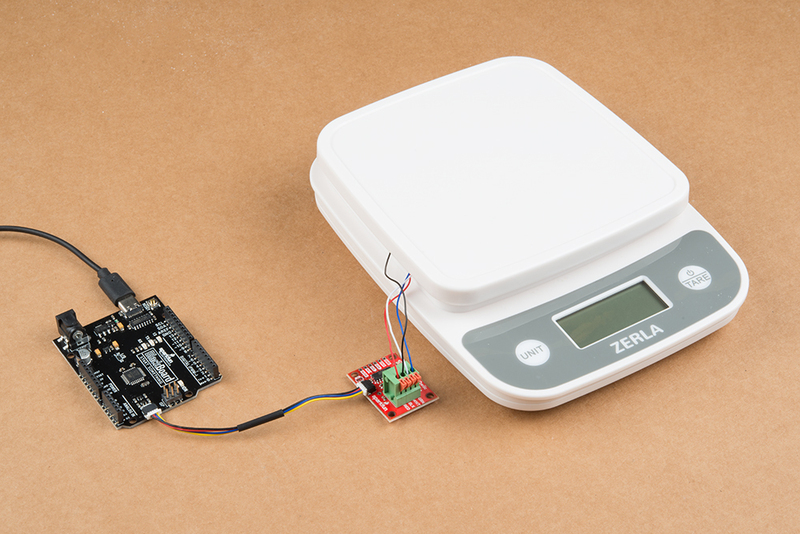 By connecting the board to your microcontroller you will be able to read the changes in the resistance of a load cell and, with some calibration, you'll be able to get very accurate weight measurements. This can be handy for creating your own industrial scale, process control or simple presence detection. Utilizing our handy Qwiic system, no soldering is required to connect it to the rest of your system. 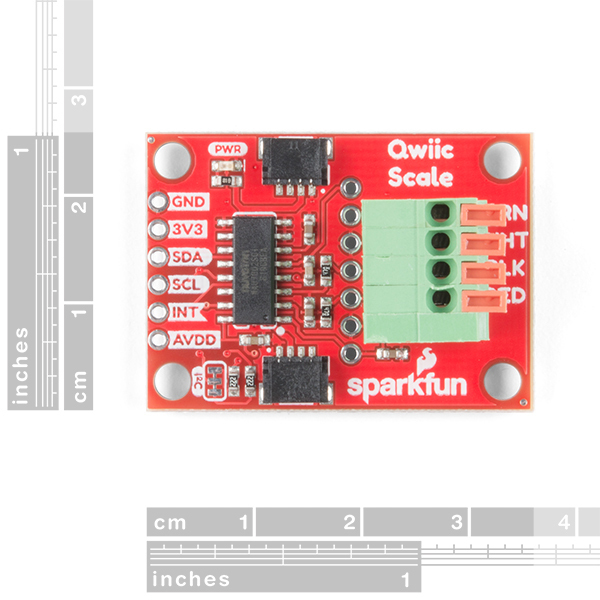 However, we still have broken out 0.1"-spaced pins in case you prefer to use a breadboard. 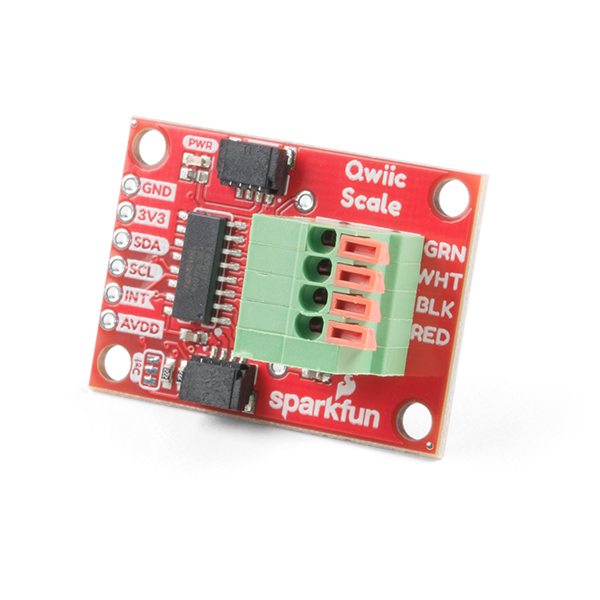 By connecting a load cell to the Qwiic Scale you will be able to translate sensor data into something your microcontroller can read. The NAU7802 is an ADC with built in gain and I2C output to amplify and convert the readings from a standard load cell. A load cell is basically a device that translates pressure or force into electrical signals. In most cases this signal is very small and needs to be amplified. There are many popular chips that read the change and amplify it, but the NAU7802 goes one step further and converts everything to a true I2C output (attached to a Qwiic connector). The board provides a four spring terminal to connect your load cell with no soldering required. In addition to the I2C pins, the board also breaks out an interrupt pin and AVDD to the edge of the board. The differential input signals (plus a second set of input signals) are broken out to the middle of the board, as well. I'm having trouble getting example1 to work. myScale.begin returns false. Which wiring is at fault? The I2C wiring or the load cell wiring? I'm using elegoo MEGA2560 R3 with a Qwiic shield board an a Qwiic cable to the Qwiic scale. I've removed the load cell wiring from the spring terminal and reinserted many times, trying to follow the recommendations in the hook up guide. Ok, by looking at Qwiic shield schematic and reading the Wire library for MEGA types, I can succesfully connect after jumping A5 on the shield to 21 on MEGA and A4 on the shield to 20 on MEGA. Basically it seems Qwiic is designed for something other than MEGA, but work around is easy. A failed begin means the I2C communication failed - it's your I2C wiring. I suspect the issue is with the Qwiic shield and the Mega. The shield assumes (poorly, bad design on my part) that SDA/SCL are located at A4/A5. I think the Mega doesn't have this. You'll need to wire to the I2C pins on the Mega. 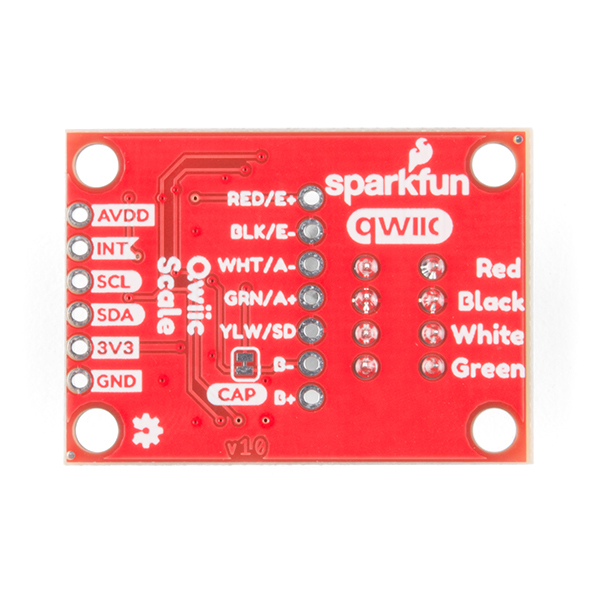 If you still want to use the Qwiic shield use an Uno or other platform that has I2C pins located at A4/A5.